Anime that are created to help promote a product, whether it is a game, a light novel or even a card game, tend to be hit or miss. When Sentai Filmworks released Leviathan – The Last Defense, an anime based around a mobile game by GREE, last year it was difficult to imagine that the series would ever get an English dub. 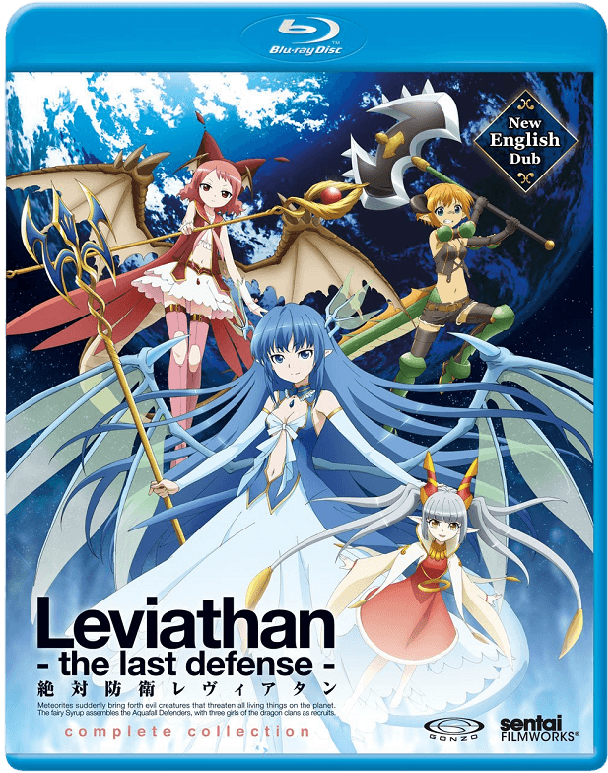 However here we are with a fresh English dub of Leviathan – The Last Defense and while we previously found the series to be lighthearted but unremarkable outside of the cute antics of the girls, does this re-release bring more to the table? The world of Aquafall has been a prosperous land where fairies, dragons, dragon-girls, and other magic beings have thrived for years. When meteorites begin falling on the world, strange creatures called Lucasites began pouring out of them with a mindless intent to destroy anything they come across. However in the town of Haruna, very few are preoccupied with the thought of this danger, choosing to send scouts out to investigate, and most of the residents continue to live out a peaceful life. A girl named Leviathan is one of the few affected by this threat as her beloved older brother left one day and has never returned, though his spear appeared reappeared and is now her only memento. While out practicing her water magic, Leviathan accidentally blasts a fairy named Syrup out of the sky and the tiny fairy takes this as a sign. You see, Syrup is trying to rally forces to fight against the threat the world is now facing by organizing an Aquafall Defense Force and thanks to Leviathan’s magic powers, she seems like a great fit. When the incredibly strong and athletic Jörmungandr and pampered but skilled with fire wielding Bahamut also meet with Syrup, the group is assembled. Or so it would seem, but the story of Leviathan – The Last Defense is about as heavy as a feather. The first few episodes of the series serve as a way to introduce viewers to each of the three girls as they go about their days generally ignoring what Syrup says and any effort in actively trying to fight against the Lucasites. In fact the first actual battle they intentionally fight against these creatures is attempting to retrieve Jörmungandr’s battle axe from inside of a swamp dragon’s stomach. Since before then, the only time the girls met with the creatures is accidentally taking them out while walking through the forest. For some time after that every fight is mostly a matter of circumstance as the girls encounter a creature while trying to do something else instead, such as have a barbecue on a beach and even then their only reason to take it down is because it ruined their meal. There are some moments that the story takes a bit of a serious tone, but Leviathan – The Last Defense never becomes anywhere near as dramatic as it may look. A cave-in with trapped family members may seem as serious as it can get in a show like this, but even then the tension is sapped away from the cutesy attitude of Syrup and the dimwitted nature of the other girls as the danger becomes an afterthought and success is always a given. 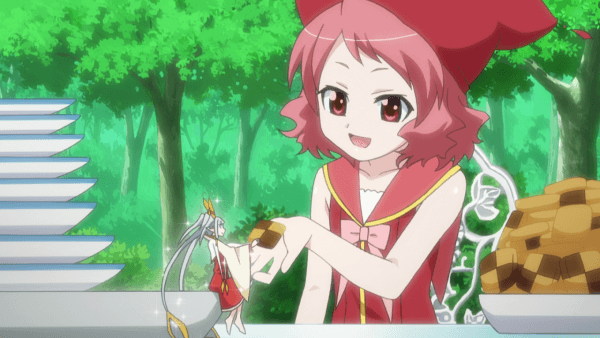 It is interesting that the fairy of the show is called Syrup mainly because that is the best way to define Leviathan – The Last Defense, since it is a show that is sugary sweet with little consistency but just enough to keep some form of a premise held together by adorable, albeit one note, characters. These characters are what make the show worth watching for those who want something simple to enjoy as the plot is far from the best aspect, though a few RPG style elements used later on are a nice little touch. As mentioned each of the characters in the series are overly cute with Leviathan being a quiet and solemn girl who loves barley tea and her missing brother, Syrup, the happy go lucky fairy with a bottomless pit for a stomach, Bahamut, the pampered princess who is always having tantrums about the girls’ situations, and the energetic Jörmungandr who is ready for anything. 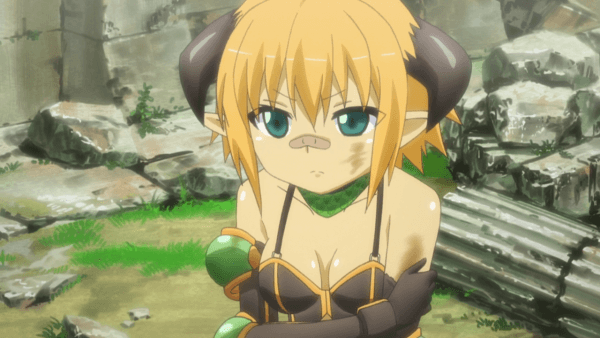 Bahamut and Leviathan go through a few small developments in the show but nothing ever goes deep or dark in this light-hearted fluffy series. By the end of the series, Leviathan – The Last Defense does find itself with a very simple resolution, which is more than one generally gets for a series based off a game, but it still is lackluster considering the problem with the Lucasites is far from over and as the girls learn, the danger they pose to the world is a reality that needs to be faced, even if there are plenty of threads left hanging when the credits roll. Even then, viewers will still find plenty of enjoyment as long as they go into the series expecting cute dragon girls doing cute things while occasionally taking on enemies and growing a bit along the way. 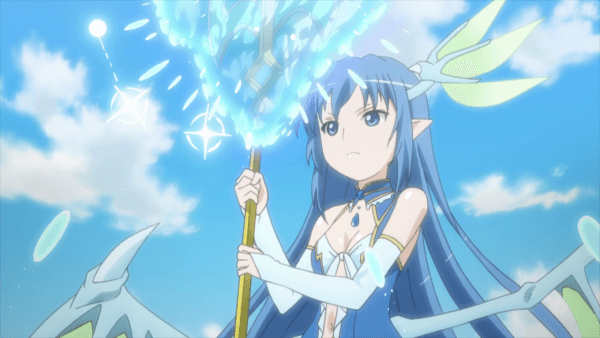 This is a series that thrives on color and moe girls being one of the selling points of the show and Leviathan – The Last Defense pulls that off quite well. The environments that the girls travel through vary decently enough and have some detail, but the highlights are the girls themselves as they are all designed to ooze cuteness at every turn. Of course this does bring with it some problems with odd looking limbs and it is pretty clear from the onset that the show had a low budget and the animation mirrors that fact. 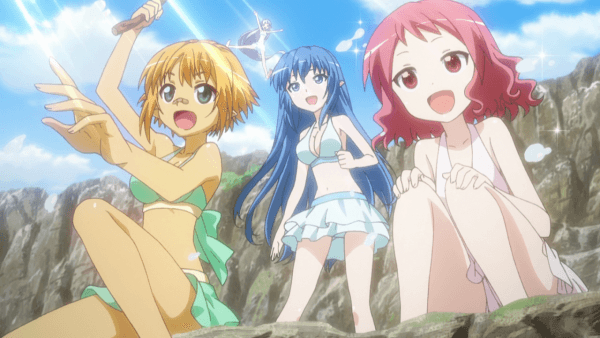 The cute aspect of the show also helps eliminate any concern for overt fan-service since, despite there being a beach and hot spring episode, the girls always have scale underwear that randomly appears and disappears depending on their clothing. 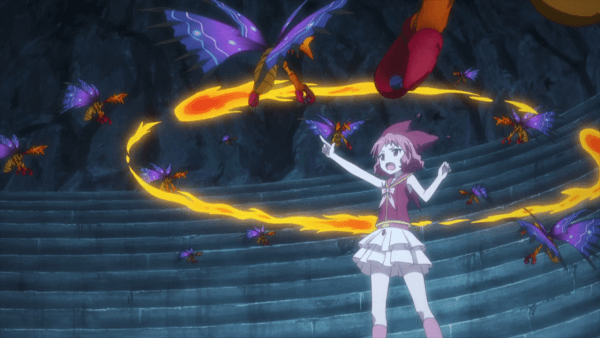 There are also magical girl style transformation sequences for each of the three girls as they assume their more powerful dragon-girl forms and these are presented nicely, although they seem to be used to pad an episode’s length at times. It is worth noting that Gonzo has used a decent amount of 3D CG for the series as every Lucacite creature is presented in this form, as well as the larger dragons, making them look incredibly out of place, and at times even the girls are shown in 3D CG while fighting the creatures. This second release of Leviathan – The Last Defense comes with both a newly recorded English dub as well as the original Japanese voice track. What is just as surprising as this series getting an English dub is that the English voice cast actually does a great job with the characters. Caitlynn French and Brittney Karbowski fit Leviathan and Jörmungandr’s personalities perfectly while Hilary Haag’s Bahamut is also fairly impressive. It is worth noting that Monica Rial’s handling of Syrup is fitting for the fairy but she does have an odd sounding take on the way that the large dragon’s they meet up with over the series sound when they speak through the character. The background music throughout the series is fairly simple and airy which fits the series, but also makes it forgettable at times. That being said, the opening theme “Hajimari no Resolution” by Yuki Kanno is a very impressive sounding opening theme that tries to present the show as a more serious series than it really is. The closing theme, “Truly” by PASSPO☆, features some nice lyrics but is a fairly standard ending theme for a fantasy series such as this. Unfortunately this second release of Leviathan – The Last Defense continues to be bare bones which is disappointing as there are extra shorts that could have been included in this release. Instead the only extra features come in the form of a clean opening and ending theme. With a fresh English dub, Leviathan – The Last Defense still remains the same series as it was before, albeit one that sporting a fresh voice track for those who prefer to listen to their anime in English. 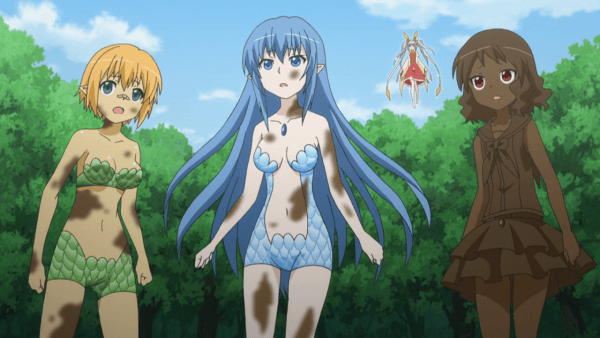 This new dub does breathe some extra life into the cutesy humor that runs rampant throughout the series and the various antics that the girls get up to. That being said the series still is little more than brainless entertainment with a light-hearted presentation and a story that doesn’t really go anywhere.